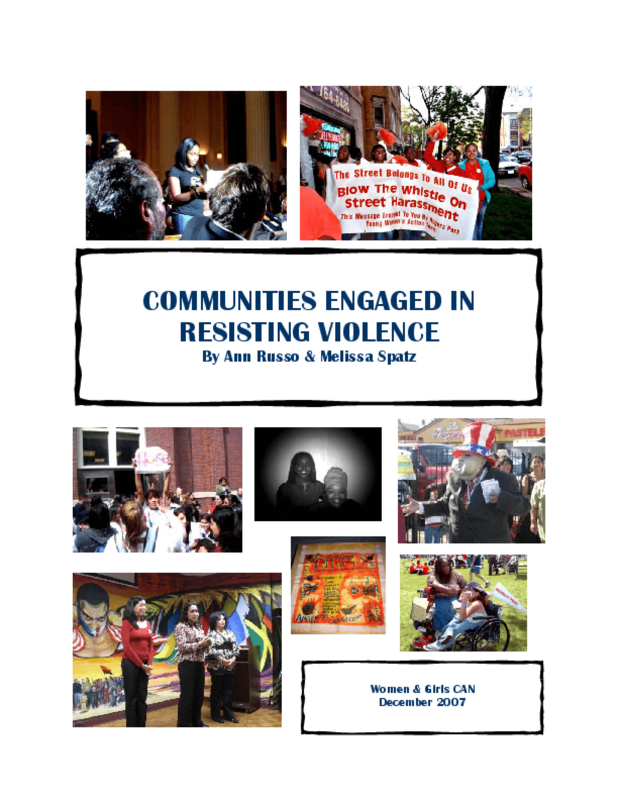 "Communities Engaged in Resisting Violence" documents a new movement in Chicago that seeks to end violence against women through community engagement and accountability, rather than solely social services and criminal justice. This report documents the innovative approaches, structures and strategies of sixteen community-based initiatives from across Chicago that are changing the way that we deal with violence against women in this society. The report then examines groups, approaches, structures and strategies, providing concrete suggestions of how individuals and communities can take action to end violence against women and girls. How anti-violence groups develop their approach: The report examines how groups have broadened the definition of violence; rethought the roles of survivors and perpetrators of violence; and identified systems of oppression as root causes of violence. How anti-violence groups structure their projects: Rather than copy the structures of the mainstream nonprofit system, groups are creating new structures and negotiating the older ones. The report looks at how groups ground their work in communities; how they grapple with the non-profit industrial complex; and how they build safe communities within the movement, including responses to acts of violence within the social justice community. Strategies to end violence: The report examines six strategies to end violence against women and girls: community engagement; community organizing; arts and performance; popular education; harm reduction and partnering with men. Copyright 2007 Women and Girls CAN.